Helicopter Wars | Does This Font Make Me Look Fat? We have beautiful old silver maples on our property – seven of them spaced around the house. Many people consider them junk trees, but I am quite fond on them. We had an old silver maple in Harford Country. It was the tree our children’s tree swing was in and it shaded our 200 year old stone house. That tree was probably 100 years old when it was felled in a storm. We replaced it with another large caliper silver maple. We hoped the family who bought our house would install a swing for their children. That’s the romantic side of the silver maple story. The downside is that they have a gazillion helicoptered seeds (called samaras) in the spring. As I look out my office window, the trees look as though they are leafing out. 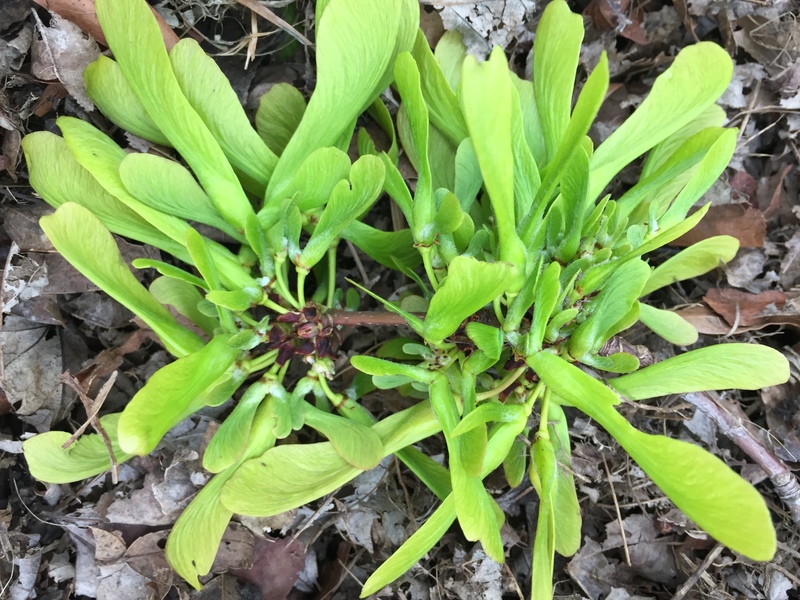 There are tiny leaves coming, but those cursed helicopters are getting ready to be blown into the quarter inch spaces between the boards on my deck. They float down gracefully, spinning one way and then become sidewinder missiles on a mission. It takes weeks for all the helicopters to come off the trees. Once we think they’re down, it takes us days to dig them out of the deck. Usually on our hands and knees with lots of cursing. So this year we decided to try and get ahead in the war on helicopters so we covered the deck with tarps! Then the wind began to blow and we scurried to find more bricks. The deck always has to be cleaned with deck cleaner once the helicopters are removed, so we are hopeful that the tarp solution will work. I am a little concerned, however, that we may grow an impressive crop of mold underneath the tarps. Enough air seems to be getting under the tarps that maybe that won’t be a problem. The helicopters are also a problem in my garden. I am amazed that the whole East Coast has not been covered in silver maples. I blow them out of the garden and into drifts on the driveway. I pull them out as they sprout. Those seeds are tenacious. I am already finding tiny maple trees in my garden beds and the helicopters have barely begun to spin. They must be from last year’s seeds. 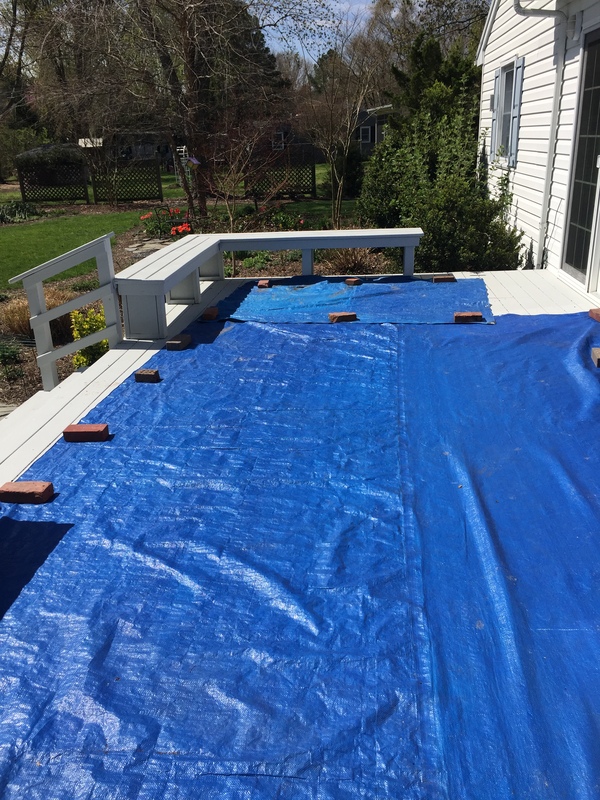 I can’t cover my garden beds with tarps, but I’m hoping they help on the deck. On Google I learned that you can eat maple seeds. Not the wings, but the seed is apparently quite good roasted. Who knew? Sounds like a lot of work to me (I buy my pistachio nuts and peanuts shelled), but if I’m in a survival situation I’m all set. This entry was posted in Gardening, Uncategorized and tagged deck cleaning, maple helicopters, Silver Maples by Mala Burt. Bookmark the permalink. I was just thinking of those little helicopter seeds the other day. I haven’t seen them since childhood, some 45+ years ago, but I remember them at my grandmother’s house. Good luck with the tarp experiment, maybe it will do the trick. As a child I used to call them Angel Wings,â¦and thought that when an angel outgrew their wings that they had places on earth where they scattered them,â¦for dreamers like me to find.